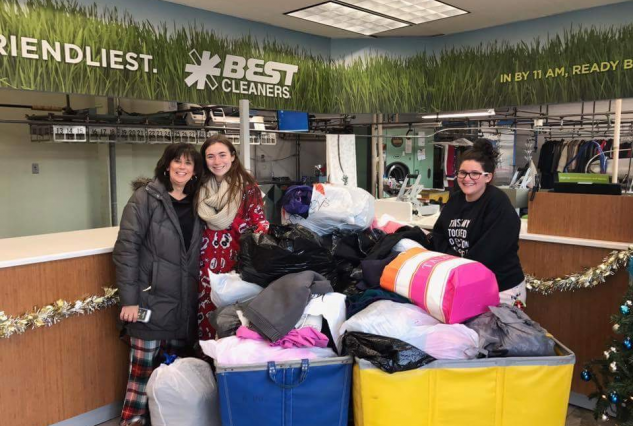 Best Cleaners wrapped up the eighth annual COATS FOR CONNECTICUT campaign this month, making the last delivery of donated coats to Salvation Army centers around the state, and far exceeding the 16,000 goal set back in November with a total of 18,168 coats processed through our 13 locations. Each week donated coats were cleaned and delivered to Salvation Army centers and shelters in Hartford, Middletown, Meriden, Bristol, New Britain, New Haven, Bridgeport, New London, and Waterbury. The huge uptick in the total number of donated coats came from expanded participation by local schools, youth groups, businesses, and Best’s campaign partners Eyewitness News WFSB-TV 3 and Young’s Printing/FastSigns. WFSB collected over 900 coats at their station headquarters, while many other local organizations held their own collection events. The total value of the donated coats and drycleaning services combined is an estimated $515,000. Pictured above are representatives from Mercy High School in Middletown who dropped off 260 coats collected by students and staff, helping make this year’s COATS FOR CONNECTICUT campaign the best yet. THANK YOU ALL!